INDIANAPOLIS -- It's a scary thought for the rest of the NFL, something the Indianapolis Colts have been waiting to spring on their opponents for four years. Andrew Luck finally is getting a full offseason to work on his craft. “I have a great deal of respect of where he has been and where he is now and we have not, I said this, we have not seen the best of this kid yet,” Colts general manager Chris Ballard said in January. After years of struggles with his right shoulder, Luck silenced those who doubted his ability to regain his form in 2018 by becoming the league’s Comeback Player of the Year. It’s time for him to take another step, a step that he hasn’t been able to attempt in four years. That’s how far back you have to go to see when Luck was healthy and was strictly able to work on being a better quarterback for the following season. There's no working with medical or training personnel to rehab his right shoulder. There's no worrying about the types of passes he's capable of throwing. This offseason is all about Luck getting better as a quarterback in order to help the Colts try to take another step after their 10-6 record and playoff season in 2018. Andrew Luck's productive 2018 put to rest any thoughts that the Colts needed to find another franchise quarterback. Most end-of-season player meetings entail the coach talking to the players about what they need to work on during the offseason. But Luck made it easy for coach Frank Reich after the Colts' franchise quarterback threw for 4,593 yards and 39 touchdowns and completed a career-high 67.3 percent of his passes. His Total QBR of 71.7 was the best of his career. Luck’s excitement about improvement is understandable, considering what he’s had to endure during the offseason in recent years. This is the first offseason since 2016 that Luck will throw a regulation-size football. Luck’s career changed when he injured his right shoulder against Tennessee in Week 3 of the 2015 season. Then he reinjured it trying to make a tackle against Denver in Week 2 of the 2016 season. The shoulder problem caused Luck to be limited in practice the rest of that season before he had surgery on it in January 2017. That’s when the long road to recovery started. There were the cortisone shots for the pain and the failed comeback in which he didn't play a snap in 2017. There was a six-week trip to the Netherlands to rehab his shoulder. The skinny physique from not being able to lift weights. The wondering if he would be able to play again. 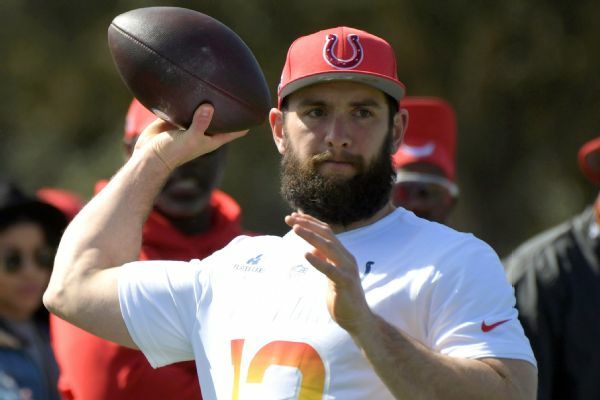 Luck’s most significant steps toward returning occurred last offseason in Southern California, where he worked with throwing guru Tom House to regain strength in his shoulder and better his throwing mechanics. House and Luck, according to Reich, continued to work together during the season behind the scenes. House, who has also worked with other top quarterbacks such as Tom Brady, Drew Brees and Matt Ryan, spent time at the Colts' facility and attended practice several times. Luck and House are working together this offseason, too. The difference this year is that they don't have to work their way up to throwing a regulation-size football. The foundation is already there. "[Work on] just mechanics," Luck said. "And what's great is, I love it because I want to keep learning, too, and I find it really dynamic. Sit down with Tom [House] and hear all his experiences and still take my kind of empirical evidence of what I’ve done and experienced and then listen to Tom. And what I like best about Tom is he’s a team player. Here’s a guy as far as working with quarterbacks, he’s at the top of the food chain. What I love about him is his team approach, which is important to us." Luck won't have to isolate himself during team activities this spring. He'll be working on the same program as his teammates instead of working on his own. The Colts are expected to start offseason workouts in the middle of April. Luck didn't throw a football in front of the media last year until the team's three-day mandatory minicamp in June. With a year of experience in Reich's offense, coupled with an offseason to focus strictly on football, the 2019 season could be even better than 2018 for Luck.